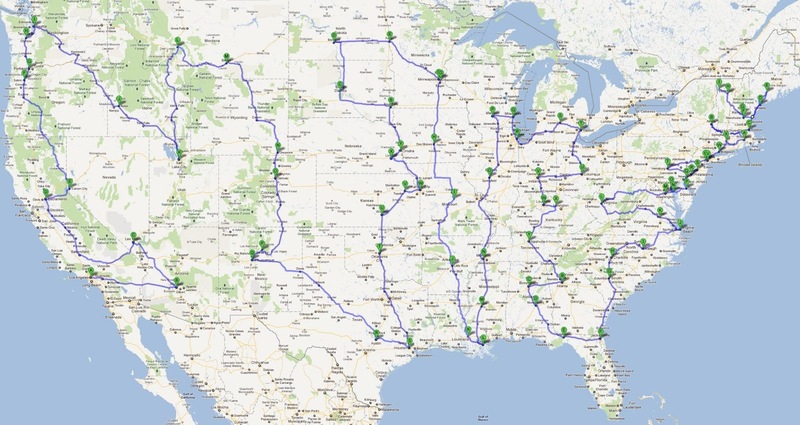 A little while ago, when I was unemployed and dreaming of all the things I could do with the money I wasn't earning, I designed my ultimate American Road Trip. Just one mega trip in which I would see every State (Hawaii and Alaska would have to be flying visits, after the fact), go to every attraction, eat every classic dish/food (unless it involves plastic cheese in a can), and meet every culture America has to offer. #1. The cost...quite clearly it'll be expensive...and I would like to have a friend/companion with me on this journey, so *boom*, I just doubled the price. #2. The visa. America is a very tricky country to get into for anything other than a short term holiday. And although this is a vacation of sorts, the three month window provided with the travel visa would not be sufficient for this to work. 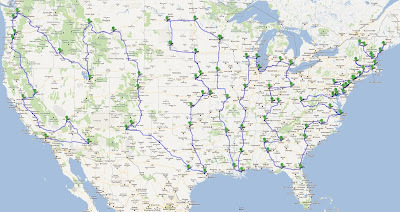 50 States + numerous things to see in each + 90 days = methinkno. Nevertheless, it's a thought...it's a goal...and you just never know. I was just thinking, maybe I could come with you, we got a visa that was valid for 10 years when we lived in Canada...but we might have to go in the next few weeks, cause I imagine those 10 years are up fairly soon! Splendid. I think it's marvelous. I particularly like the trip from Detroit to Birmingham.